One word summary for the book- “Kinesiology“. My first reading on the subject of Kinesiology – the muscle testing to find the “truth” of a statement or item. Through the feeling of life-supportive energy patterns or life-destructive patterns, one can “rate” an event or item. Hawkins uses about half of his book towards laying the historical, specific techniques and scientific foundations of Kinesiology. Hawkins then goes into social structuring, and uses in Marketing, Sports, Politics and Physical Health. Kinesiology is a direct relationship with your Self as it reacts to the differences between Truth and Falsehood. “Kinesiology, reveals the hidden implicit order by making it explicit.” It is experienced as “Powerful attractor patterns make us go strong, and weak patterns make us go weak.” Yes, some of it sounds similar to some Rupert Sheldrake’s Morphic Fields discussions, which Hawkins acknowledges two or three times. Throughout the book Hawkins describes his syntax separation in the title of the book. I did like the descriptions and got a greater feel for his perception that separates the two words. After a few statements I had to ask “How would he know that? That sure seems like a mighty guess or assumption.” But then I have to remember I’ve a novice on the subject, and it is a different energy- minded level of work, so I’ll grant creative license. After all, how DO ANY of us KNOW what we write about Consciousness is True, besides by experiencing and feeling it? “The solutions that have power are the ones realistically based at the level of Acceptance (350) rather than condemnation (150, the level of Anger).” – Hence why Fostering the Positive always will create a win-win instead of “fighting” against the negative. As far as Sports motivation – Pride is calibrated at 175 and the athlete goes weak. However, if you use a higher motivational factor like honor, love or sheer joy the athlete grows stronger. Summary – I always appreciate learning about a new subject matter. Although one may be a novice on a subject, he or she still feels something from reading it. This book left me feeling “Over-labeled.” I’m a big believer in Labels as indicative only of that person’s perspective. I was left feeling “Does everyone respond the same way to the Truth?” In ANY subject matter, let alone perspective on Consciousness, would everyone respond with a similar “Rating”? I felt very interested in his discussions and perspectives on Consciousness, but the whole static number label just didn’t sit right with me. However, knowing that Kinesiology has “helped” a friend while trying to determine better medication, I do feel there’s an untapped, yet not well understood (by me) response to Energy there. 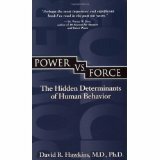 This entry was posted in Book Reviews, Daily Blogs and tagged book reviews, Consciousness, Dr.David Hawkins, Kinesiology, Labels, Morphic Fields, Power vs Force, Rupert Sheldrake by MomentumMikey. Bookmark the permalink. That’s good. Kinesiology is based entirely on resistance. I can muscle test or be aware of resistance to validate truth. Even using a necklace as a pendulum is a vibrational observer of truth. Invalidating the truth (force) by virtue of offering a rigid muscle test obscures, providing the lack or invalidation regardless of the “testee” trying so hard, and the muscle is tense, to be “right”. The truth is absent in a rigid muscle test. Sort of like someone insisting something is correct when the truth says differently. It has the same resistance load. THANK YOU!!!! that adds to my slight understanding of it in a big way, and I appreciate that. So THAT’s why you are the Natural SAGE!! I’ll reread that note a few times. I really appreciate you helping me understand it a bit more and I love to hear from another that it is a valuable tool. thanks!